I had no expectations when I went to see this film other than it sounded fun and was a comedy. The film turned out to be a real surprise and headed off in a direction I was not expecting. This is one of those movies that really makes you feel good. I highly recommend it and the less you know about the story the better because it makes it more of a surprise as it unwinds. Great writing! Great acting! And great directing! I would definitely see this movie again, and I do not say that about many movies. For those who like French cinema, or would like to try something different this will be a delightful film you will want to tell people about. 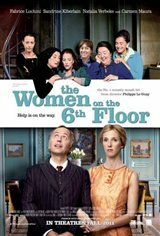 cute movie, loved the energy of the Spanish women on the 6th floor! Good film, emotion and humour ! You like french film, so see it ! watch a lot of subtitle movies and this one will keep you on your toes.